Once upon a time I didn’t believe in wearing white after Labor Day. What a silly, old rule that I’m so relieved I haven’t followed in a long time. White is the perfect color for the winter months because it freshens up any outfit and accentuates the colors worn with it. Don’t be someone who never attempts the look because you aren’t confident in it. Just follow my tips and you’ll be sporting white pants year round in no time. Make them winter appropriate. The key to wearing white pants in the winter is making sure they don’t look like they should be worn in the spring or summer. For example, if I wear white pants with a bright pink sweater it could look a little like spring. If I wear a navy and white stripe sweater with white pants, it takes on a summer nautical feel. I’m not saying it can’t be done, but it’s little harder to pull off. If you feel like your outfit has too many spring/summer colors in it, layer a neutral blazer over it or choose darker footwear to help tone it down. Winter fabrics and textures are your friend. Making sure the fabrics worn with your white pants are winter friendly is foolproof way to create an outfit around white pants. 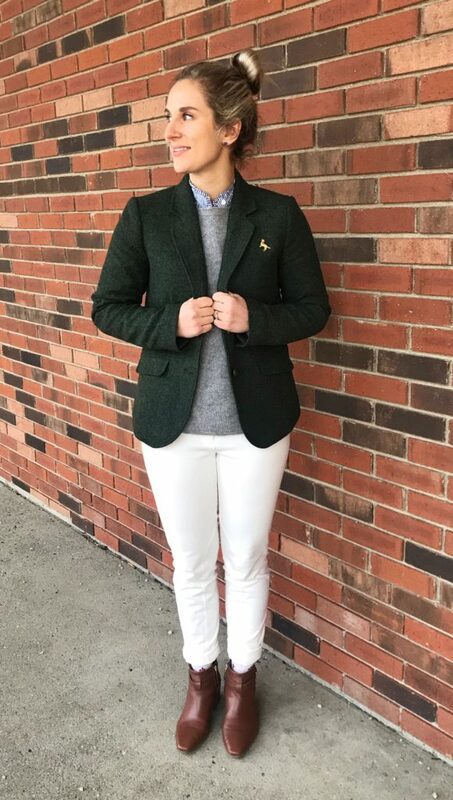 For example, in the photo above I wore a dark green tweed blazer, and a gray sweater with my white pants to tone them down and make them winter appropriate by using heavier, more winter appropriate, texture and fabrics. Layering is the way to go. The easiest way to wear white pants is to wear layers over it. Button down shirts, sweaters, jacket, blazers, all create dimension as well as keep you warm. 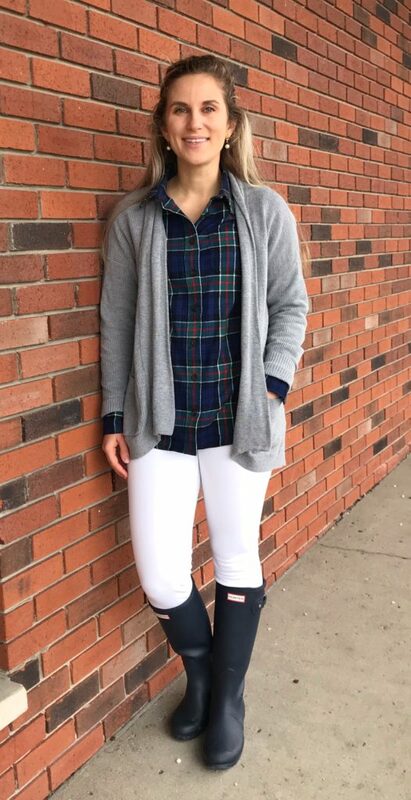 You rarely layer a ton with a spring/summer outfit so this look is unique to winter. When in doubt, add boots. 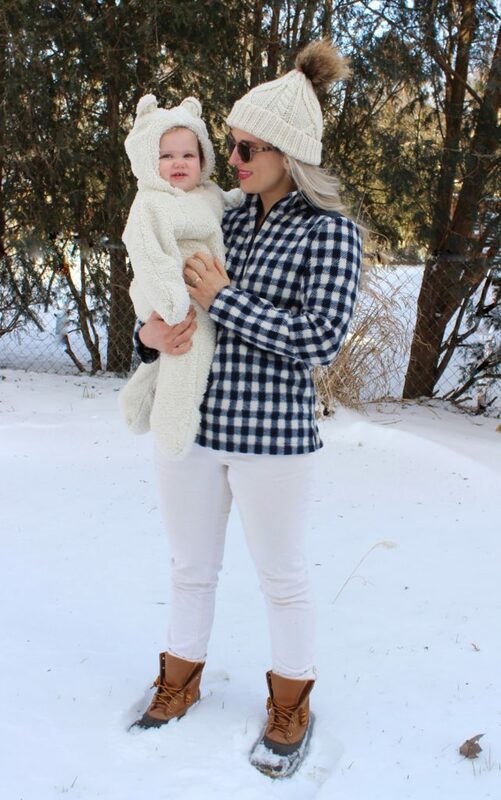 Boots are also going to help make your white pants look winter appropriate because they are an item seldom worn in spring and summer. 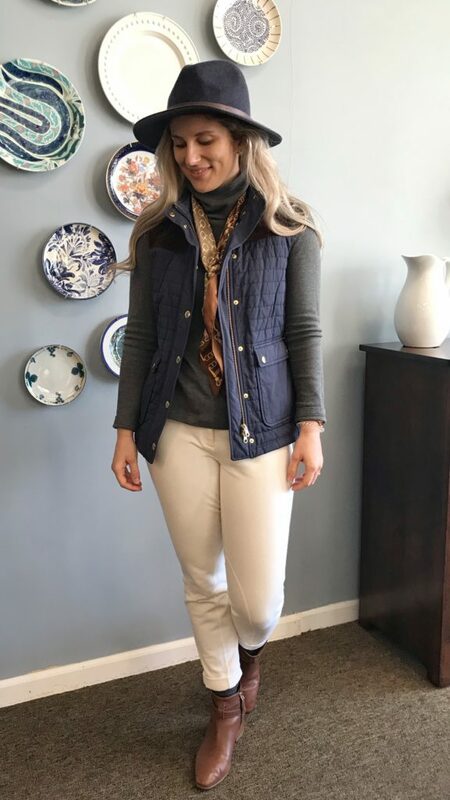 I took the outfit above and added boots and a fleece (another fabric specific to cold weather), and I have a fresh look to help beat the winter blues. Love this post! I am always so nervous wearing white in the winter as I sometime feel it can be too summery. These are great outfit inspirations! thank you so much! I think fabric is a big component of it. I shy away from white denim and opt for a thicker knit or white cords.